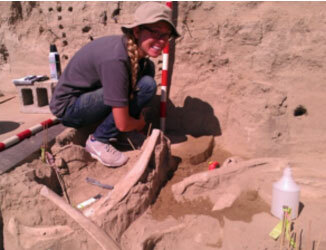 Join us for the opening of the 2015 dig season at Coyote Canyon Mammoth Site. Thank you to everyone involved with its organization and implementation. Thank you to all who attended and shared in this fun and informative day! Check the calendar for upcoming public tours. Keep checking this page for upcoming activities. Try your hand at wet screening. Visit the Dig House museum. See all the mammoth bones. And, sample our brand new Mammoth Brew by Ice Harbor Brewing Company. Root beer available for the kids and fun for everyone! Come see what we’ve unearthed right here in Kennewick. The tour will be led by Gary Kleinknecht, an expert in the field of Ice Age Floods. It will begin with a trip to the Coyote Canyon Mammoth dig site and then to Wallula Gap and the Lower Walla Walla Valley. Tour includes tour guide, beverages, bus, and lunch. - You must purchase tickets from Kris Cargile (509-943-4100, ext. 108) at The REACH by August 10. You are cordially invited to the first annual celebration of the Mid-Columbia Basin Old Natural Education Sciences (MCBONES) Research Center Foundation. 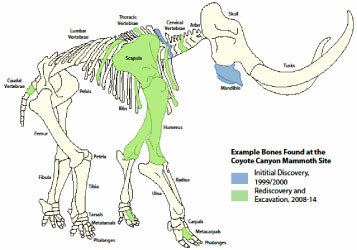 The centerpiece of this organization is the research being conducted at the Coyote Canyon Mammoth Site, site of a 17,500-year-old Columbian Mammoth. Please join us to celebrate our efforts to excavate and study the Coyote Canyon Mammoth and its environs and to provide local teachers, students, and citizen scientists an opportunity to actively participate in field and laboratory-based research. 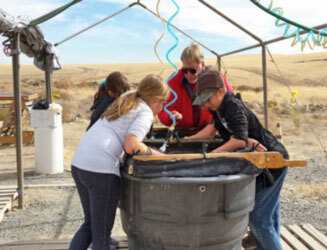 These efforts are furthering our mission to develop a premier regional resource for supplementing traditional curricula for educating and training the next generation of scientists and engineers, and to spark scientific inquiry throughout the community. We look forward to sharing with you our major accomplishments through 2012, and to honor the students, teachers, and volunteers who made significant contributions. We also want to let you know what we are planning for 2013. Please come and enjoy some light hors d'oeuvres, socialize with the principal scientists and fellow volunteers, and participate in a silent auction to support continued research and education at the Coyote Canyon Mammoth Site. Please RSVP or call 509-946-8050. The Lakeside Gem and Mineral Club is hosting the Northwest Federation of Mineralogical Societies (NFMS) Show at the Benton-Franklin Fairgrounds in Kennewick, Washington. The MCBONES Research Center Foundation will be hosting a booth at the show in conjunction with the Lake Lewis Chapter of the Ice Age Floods Institute. 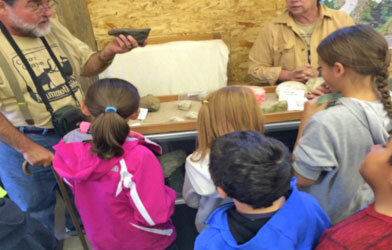 Cindy House will be giving a talk at the show on Saturday, May 19 from 12:30-1:30 PM and then will be leading a tour of the Coyote Canyon Mammoth Site from 2:00-4:00 PM.